04/18/19 - Added July's Nova-related solicitations to News. 03/30/19 - Added Novaverses #8 to Creative/Novaverses. Special thanks to Darren Blackburn and crew for the great work! 03/29/19 - Added Champions #4 preview to News. 03/26/19 - Added History of the Marvel Universe's Sphinx to News. 03/20/19 - Changed poll question and posted previous results to News. 03/20/19 - Added February's Nova-related sales info to News. 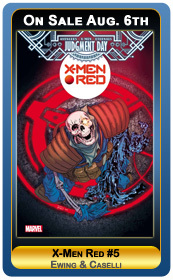 03/20/19 - Added June's Nova-related solicitations to News. 03/15/19 - Added Guardians of the Galaxy #3 preview to News. Nova and other characters mentioned and the distinctive likeness(es) thereof are Trademarks of Marvel Characters, Inc.
and are used with permission. Copyright 1976 - 2019 Marvel Characters, Inc. All Rights Reserved.